(TibetanReview.net, Jan27, 2018) – Followers of the Nyingma tradition of Tibetan Buddhism, the oldest among the five major schools, have a new head. 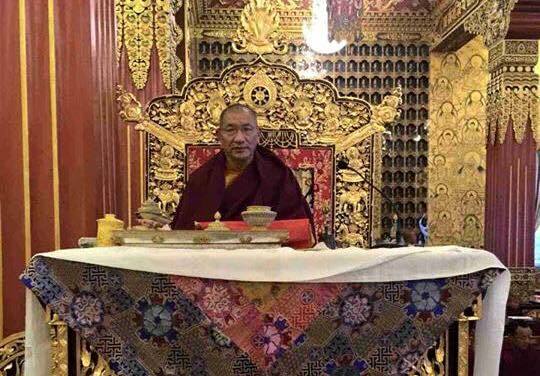 The Fourth Kathok Getse Rinpoche Gyurme Tenpa Gyaltsen, holder of the Kathok Monastery lineage, has been made the 7th head of the Nyingma school of Tibetan Buddhism for a three-year term. The decision was reached at a recent meeting of Nyingma representatives, said the Central Tibetan Administration at Dharamshala, India, on its Tibet.net website Jan 25. The decision was said to have been reached unanimously during the 29th Nyingma Monlam, or prayer festival, held in Bodh Gaya just recently. Five other Nyingma lamas were also stated to have been chosen as the supreme head of the Nyingma tradition, with each scheduled to serve on rotational basis for three-yearly tenures after the newly chosen head. They will be the heads of the Zogchen, Shechen, Mindrolling, Dorje Drak and Palyul monasteries. The current Kathok Getse Rinpoche was born in Golok, Eastern Tibet in 1954. He was recognised by the 16th Gyalwa Karmapa after the passing away of the third in 1952. He came into exile in 1997. The previous head of the Nyingma school, Kyabjé Taklung Tsetrul Rinpoche, passed away in Dec 2015, aged 89.